Disney's Art of Animation Resort, the newest Disney World hotel, has 1,120 family suites and 864 standard guest rooms. The hotel draws its inspiration from four classic Disney and Pixar animated films: Finding Nemo, Cars, The Lion King, and The Little Mermaid. Disney has seen the need for rooms that can accommodate larger families and multi-generational groups and the family suites will do just that – they can accommodate up to six people; or even seven guests, if one of those guests is a child in a crib. The kitchenettes in these suites can help families keep their dining expenses down. The 11,859 square foot feature pool, located in the Finding Nemo wing, is the largest swimming pool at the Walt Disney World Resort, outside of the water parks. One of the really neat things about the "Big Blue" pool is that you can hear Finding Nemo characters and music under the water. In addition to the feature pool, there will be two smaller pools (in the Cars & The Little Mermaid courtyards) and a children's water play area at the resort. Disney's Art of Animation Resort, is generating a lot of excitement and is sure to be a popular choice with guests of all ages. Advantages - Clean, comfortable setting with a huge pool and incredible, colorful Disney/Pixar themed courtyards. The Family Suites can accommodate larger families and multi-generational groups at a price point that is much lower than the Deluxe resort villas. If you're looking for an immersive Disney/Pixar experience, this resort will certainly provide it. Disadvantages - This resort is a more expensive than the other value resorts. The Little Mermaid Standard Rooms have such limited quantity and are so popular that Disney has excluded them from every discount and promotion since they opened. The Family Suites have typically been included in discounts and promotions. The Little Mermaid section has standard rooms with exterior walkways like the All-Star and Pop Century Resorts. 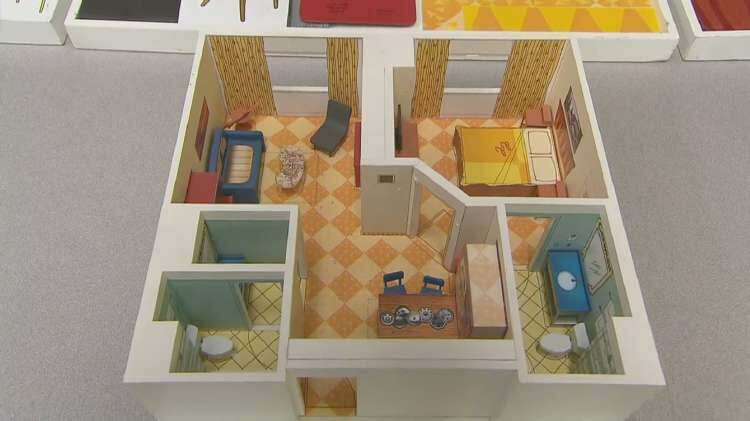 The standard rooms will have two double beds and are 277 square feet. The Finding Nemo, The Lion King and the Cars buildings feature family suites that have a bedroom with a queen-sized bed. The living room area has a kitchenette, table that converts to an Innova-bed, and a sleeper sofa. 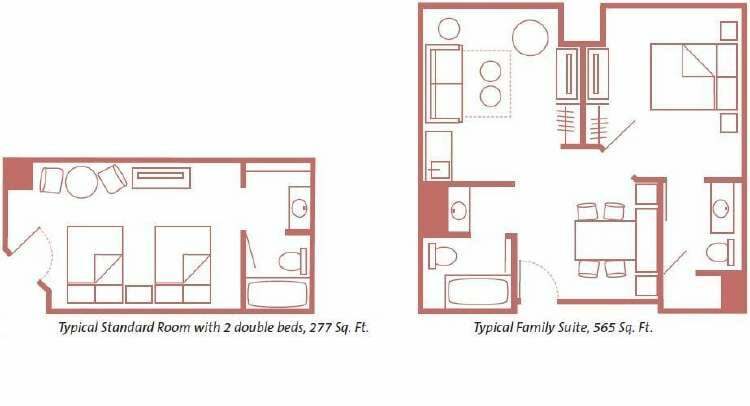 The family suites are 565 square feet. We'd like to point out that it isn't just beloved Pixar/Disney movies that are celebrated at this resort, it is called "The Art of Animation" for a reason and you'll see that reflected in the buildings. Note the giant sketch pad motif in the photo below and the simple line drawings of 'Mater on the white sheets of "paper" on the buildings. You'll also see the animation process honored in the names of the resort services: Animation Hall, Ink and Paint Shop (gift shop), and Landscapes Cafe. Computer Generated Imagery (CGI) Animation is the inspiration for the name of the Pixel Play Arcade. Squirt's Righteous Reef Playground in the Finding Nemo Courtyard. Landscape of Flavor Food Court - a cafeteria style, quick service restaurant. This food court features 5 mini-shops: the Soup-Salad-Sandwich Shop / The World Flavors Shop / Pizza Shop / Burger Shop / "Grab'n Go Market Shop"
Pool Bar - Specialty drinks, beer, sodas, etc. Ink and Paint Shop in the Animation Hall Building for sundries and souvenirs. Groceries - You can save time and money by having snacks, and bottled water delivered directly to the resort by Garden Grocer - Click HERE for more information. Regular hotels rooms do have mini-refrigerators but do not have microwaves or coffee makers. Family Suites have mini-refrigerators, coffee makers and microwaves. Little Mermaid Standard Room – Sleeps up to 4 (or 5 with a crib). 2 double beds or 1 king bed. The Lion King Family Suites – sleeps up to 6 (or 7 with a crib). Queen-size bed in the bedroom, Double-size Inova Table Bed, Double-size sleeper sofa. These suites also offer 2 bathrooms, a mini-kitchen, reading chair and table and chairs. Cars Family Suites – sleeps up to 6 (or 7 with a crib). Queen-size bed in the bedroom, Double-size Inova Table Bed, Double-size sleeper sofa. These suites also offer 2 bathrooms, a mini-kitchen, reading chair and table and chairs. Finding Nemo Family Suites – sleeps up to 6 (or 7 with a crib). Queen-size bed in the bedroom, Double-size Inova Table Bed, Double-size sleeper sofa. These suites also offer 2 bathrooms, a mini-kitchen, reading chair and table and chairs. Disney's Art of Animation Resort includes rooms available to Guests with disabilities, including wheelchair-accessible bathrooms and rooms designed for the hearing impaired. Guests may use Disney's Magical Express - a shuttle bus service included in your reservation - between the Orlando International Airport and Disney's Art of Animation Resort. Complimentary transportation to the Walt Disney World golf courses is arranged through the resort concierge desk. Guests must have a tee time reservation with confirmation number and transportation should be arranged the day prior to your tee time. We wish this resort was open when we were raising our four kids because we always had to rent two connecting rooms and a well-themed suite like this would have been more fun. The theming of this resort is just fantastic, and this has quickly become one of the most popular hotels at the Walt Disney World Resort. Each courtyard is scaled so that you "fit" into the scene so that you are IN the animation. This charming hotel is probably the most "Disney" of any of the Walt Disney World Resort hotels, making it a delightful choice for kids and Disney fans. A nice bonus is that you can see some of the higher fireworks from Epcot's IllumiNations over by the lake, at the back of the Lion King area. • Disney's Art of Animation Resort is Disney World's 26th Resort. The resort plan was officially announced on May 12, 2010 with construction beginning in summer 2010. • Disney's Art of Animation Resort is near Disney's Pop Century Resort. Originally, Pop Century was going to be built in two sections with the first section called “The Classic Years” (the current Pop Century Resort). The second section was to be called “The Legendary Years” and would be built on the spot now occupied by Disney's Art of Animation Resort. Construction had started on “The Legendary Years” but stopped when tourism dropped following the September 11, 2001 attacks in New York. • Back in 1985 – 1992, Epcot had two afternoon shows – Skylaidescope (1985 – 1987) and Surprise in the Skies (1991 – 1992) that featured ultra-lights that took off and landed in the area that is now Disney's Art of Animation Resort. • The Topping Ceremony for the Art of Animation Resort took place on July 21, 2011 on The Lion King wing, when the construction and engineering crews placed the highest piece of steel on a building's frame. The tradition dates back to the Vikings, who would place an evergreen tree on the top of a building to celebrate and wish for good luck. • This resort celebrates two Pixar Films – 3 Cars buildings and 2 Finding Nemo buildings. The only other Disney World hotel featuring a Pixar movie is Disney's All-Star Movies which has two Toy Story buildings. 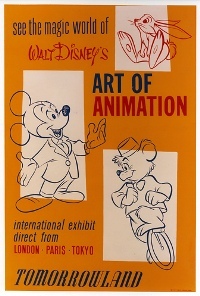 • The Art of Animation was also the name of an exhibit at Disneyland from May 28, 1960 to September 5, 1966. This exhibit presented artwork that had been part of a traveling display that promoted the release of Disney's animated feature film Sleeping Beauty. • Hong Kong Disneyland has an Art of Animation exhibit on its Main Street, U.S.A. It features conceptual artwork from the 1920's to present, storyboards and background paintings of Disney characters. • The Art of Animation is also the name of a book by Bob Thomas that was released by Disney in the 1950's. That book influenced John Lasseter - Pixar's chief creative officer and the director of Toy Story, A Bug's Life, and Cars; he said, "When I was in high school I read this book called, The Art of Animation, by Bob Thomas, it's all about the Walt Disney studio and the making of Sleeping Beauty. I read this and it dawned on me - wait a minute, people do animation for a living?" • Disney's Art of Animation Resort is adjacent to Disney's Pop Century Resort, Disney's Hollywood Studios theme park and the ESPN Wide World of Sports Complex.